A separator enabling separation of particles of sizes down to 10µ (option 3µ) by settling them in motionless liquid volume. Periodical settling of fluid under motionsless liquid volume in a lamella package and automatically discharge of decanted fluid and separated wastes. 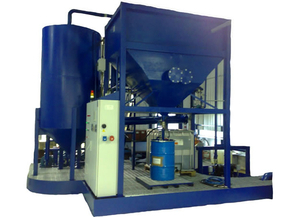 Automatically operating cleaning system of the lamella package. The unit is complete including: Lamella separator, dirty tank, clean tank , supply pumps and automatic topping up system. The lamella separator has an automatic self-cleaning system. The sludge is collected directly into standard sludge barrels. The unit is automatic and of type:Lean maintenance and no consumables.